Ronnie Lott is a retired NFL cornerback who played for the San Francisco 49ers from 1981–1990, the Los Angeles Raiders from 1991–1992, the New York Jets from 1993–1994, the Kansas City Chiefs in 1995 and the San Francisco 49ers again in 1995. Lott is a four-time Super Bowl champion for Super Bowls XVI, XIX, XXIII and XXIV plus he is a ten-time Pro Bowl selection for 1981 to 1984 and 1986 to 1991. Lott also was an eight time First-team All-Pro for 1981, 1983 and 1986 to 1991. Lott’s jersey number 42 was retired by The San Francisco 49ers in 2003 plus he was inducted into the Pro Football Hall of Fame in 2000. Sports Speakers 360 is a booking agent for pro athletes. 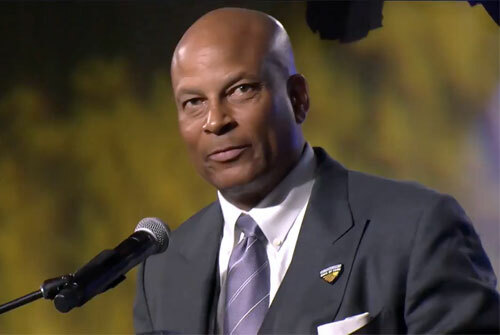 If you would like to book Ronnie Lott for a speaking engagement, appearance or endorsement, contact a Ronnie Lott booking agent for fees at 1.855.303.5450.